WCS is grateful to the Wilson Education Partnership (WEP) for awarding mini-grants to 23 of our educators! The grants ranged from $57 to $1,000 (which was the highest amount that could be awarded) for a grand total of $14,000 back into our schools. • Frederick Douglass Elementary, Stantonsburg Elementary and Speight Middle received a $999.12 grant for a mobile STEM lab project proposal from Christine Mitchell. • Frederick Douglass Elementary received $950 grant for a “Let’s Break Out of the City” project proposal from Sabra Green. • Jones Elementary received $1,000 grant for a “Jaguars Full STEAM Ahead” project proposal from Tamara Arizpe and Cara Patterson. • Barnes Elementary received a $966 grant for a “Building Knowledge with Legos” project proposal from Jennifer Delano Gemzik. • Winstead Elementary received a $677.34 grant for the Winstead Workshop Makerspace project proposal from Cindy Murphy. • Jones Elementary received an $835.42 grant for a “Student Resource Science Learn Ed Notebooks” project proposal from Jeremy Kirby. • Stantonsburg Elementary received an $800 grant for an “Unlocking Critical Thinking” project proposal from Susan Strickland. • Barnes Elementary received a $158.65 grant for STEM bins for student interaction project proposal from Karen Howell. • Wilson Early College Academy received a $954 grant for a “Breaking Out with Breakout EDU” project proposal from Shannon Campbell. 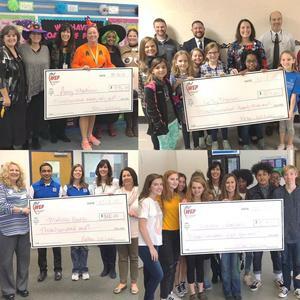 • Winstead Elementary received a $760.02 grant for a Winstead STEM project proposal from the school’s fourth-grade teachers. • Hearne Elementary received a $428.51 grant for a “Guiding Students to Become Excellent Readers” project proposal from Serita Braswell. • Winstead Elementary received a $1,000 grant for a “College and Career Readiness Town Hall” project proposal from Blake Tucker. • Darden Middle received a $334 grant for a “Showcasing Our Artists” project proposal from Melissa Butts. • Frederick Douglass Elementary received a $923 grant for a “Building the Book Room Guided Reading Sets” project proposal from Kelly Thomas. • Lucama Elementary received $57.60 for an “Engaged Learners with Fidgety Feet” project proposal from Leah Bissette. • Lucama Elementary received $298.57 for a “Movement in the Music Room” project proposal from Jana Winders. • Elm City Middle received $695.05 for a “Fighting Obesity with Fitness” project proposal from Brent Pearson. • All schools’ Exceptional Children Programs received $932.41 for a “PE for Me” project proposal from Amy Stadiem. • Springfield Middle received $151.80 for a “Key to Our School: Collaborative Community Mural” project proposal from Abby Boykin. • Hunt High received $934.40 for a “Communicate and Share our Social Stories” project proposal from Bonita Mildon, Jan Wooten and Chris Beneck. • Forest Hills Middle received $165 for a “Bouncy Bands for Desks” project proposal from Sharon Jones.